Property Search > News & Events > Half term Halloween party ideas! Half term Halloween party ideas! As the spooky season draws nearer, your kids may be asking you to host a Halloween party for their friends this year. Here’s some fun ideas that won’t break the bank. Spend some time with your little ones designing your very own movie cave – enter if you dare! Simply grab some bed sheets and use pegs and string to attach the sheets to your furniture. Throw in some pillows, blankets and snacks to make your movie extra cosy. 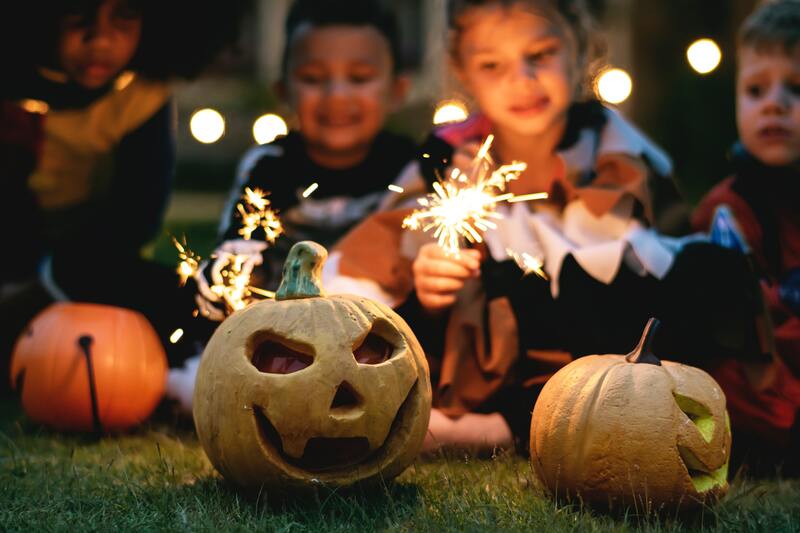 Your kids will love building the fort with you, and you can play classic Halloween-themed films, such as The Nightmare Before Christmas, Hocus Pocus and Casper! Half term will be your opportunity to get your costume sorted. For a little ghost it could be as easy as cutting eye holes in an old sheet. If you’re thinking zombies, try chopping up some old clothes and smearing them with some red paint. Or if you want something more adventurous, it’s always good fun to practise face painting! Snazaroo have some easy tutorials on their website. When your guests get hungry, wow them with some of these exciting snacks. And don’t worry! They’re all very easy to make. “Wrap the Mummy Race” – put your guests into pairs and give each group one roll of toilet paper. When the clock starts, the kids must use the paper to wrap up their partner as quickly as they can. The winner is the group to finish their roll first – you can also add in a bonus award for neatest mummy! “Flap the Ghost” – Either pre-cut a selection of ghosts for your guests, or give them pens, paper and scissors to create their own. Each player is equipped with a magazine and must use it to fan their ghost across the finish line first. “Admiral Nelson” – this one will get a great reaction from the kids! All you will need is a blindfold, a hat, a woollen coat, a stool / chair / walking stick, a tin of spaghetti and a plate. Get the kids to queue up outside the door and ask them to wait until they are called. Each child should be blindfolded before they come in (one at a time). Then briefly tell the child who Admiral Nelson was, and that you have been able to get hold of his body. You then say, “This is Admiral Nelson’s hat”, giving them the hat to feel. Then, “This is his coat”, giving them the coat to touch. Next, make sure the stool is upturned, and give them a leg to feel, saying “This is his peg leg”. Finally, give them the tin of spaghetti emptied out onto the plate and say, “this is his brains”. We hope you have a very happy Halloween and enjoy trying out these ideas. Tag us in your Halloween pictures on Twitter and Facebook – we’d love to see what you’re up to!